Although many were on vacation or travelling, about half of the Sutter staff enjoyed taking part in the run in summery weather on June 11, 2015. “We’ll do it again next year”, they enthused. The Sutter Marketing team attended the European ENT Congress with their own stand and hosted a Sutter Conference with 33 participants in Prague afterwards. At both events, the 4Rhino distributed by Sutter attracted wide interest among visitors and participants. Sutter Medizintechnik was honored by the German ENT Society (Deutsche Gesellschaft für Hals-Nasen-Ohren-Heilkunde, Kopf- und Hals-Chirurgie e.V.) for its longstanding commitment and active contributions to the development and distribution of medical devices in ENT. On the occasion of the opening celebration of the 86th annual meeting of the ENT Society, Bert Sutter was awarded the Medal of Merit 2015 by Prof. Dr. Werner Hosemann, President of the ENT Society, in Berlin on 13 May 2015. On May 18, 2015, the German TV channel ARD discussed the much-debated TTIP trade agreement in its documentary broadcast “Die Story”. Bert Sutter, who was one of the representatives of medium-sized companies chosen for an interview, was able to describe the company’s good business relationship with U.S. companies. Sutter Medizintechnik has invested over a million euros in machines and new buildings while taking into consideration the latest ergonomic and ecological standards. Instruments such as forceps, clamps and probes can now be insulated electrically under ideal circumstances for optimal results in a new and highly modern coating facility. A study in evidence class 1b has confirmed that the reduction of the nasal conchae with the Sutter radiofrequency generator is safe and efficient. After successfully establishing its subsidiary, Sutter Pacific Ltd, in Hong Kong, Sutter will now open a foreign representation in Shenzhen (People’s Republic of China). While the subsidiary in Hong Kong looks after Sutter’s distribution partners in the Asia-Pacific region, the Chinese office will focus on the huge Chinese market. “We want to offer excellent service, short reaction times and competent service to our partners in the Asia-Pacific region and China. To achieve this, we need to be geographically present. We are happy that the new office in China will help us to be available locally in the future”, says Bert Sutter, Managing Director. With the slogan “Innovations in medical technology” Parliamentary Secretaries of State, Ernst Burgbacher (German Federal Ministry of Economics and Technology), Thomas Ilka (German Federal Ministry of Health) and Dr. Georg Schuette (German Federal Ministry of Education and Research), visited the MEDICA medical show in Duesseldorf this year. 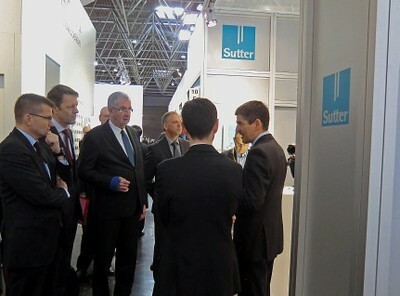 Managing Director Bert Sutter welcomed the three secretaries of state at the booth of Sutter Medizintechnik on the opening day of the MEDICA and presented the Sutter company to them. They stayed on for constructive discussions about “regulatory obstacles in an international setting” and the promotion of innovations for small and medium-sized medical device companies. Confirmation of the efficacy of Sutter RF systems for turbinate reduction. In a prospective, randomized, simple-blinded, placebo-controlled, cross-over study at the ENT university hospital in Mannheim 20 patients that were treated with the CURIS® generator showed significantly better results than those who underwent placebo treatments. Once in a while you have to celebrate. 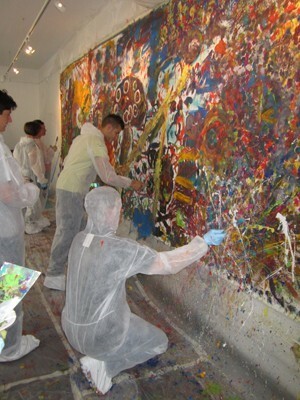 For our annual company event we met in a remodeled industrial hall for “action painting” this year. In the spirit of Jackson Pollock we gave free rein to our creativity and had a lot of fun. Pieces of our works in acrylic on canvas will soon adorn the rooms on our premises. On the Sutter premises in Freiburg new facilities for a modern coating plant are being built this year. The new plant will be the forth building on the company grounds. In 2012 a total of more than € 1 million will be invested in buildings and technical equipment. “We are convinced that these investments will support our growth strategy. We strive to live up to our claim for the quality and user benefits of our products without compromise. Not only do our many investments promote our advances in technology, but also do they safeguard the jobs on site in Freiburg”, says Bert Sutter, Managing Director of Sutter Medizintechnik. Sutter Medizintechnik was again re-certified according to the International Standard ISO 13485:2005 and Annex II of the Medical Device Guideline 93/42/EEC after an intensive audit lasting several days. Additionally Sutter has gained the prestigious CMDCAS certification for Canada. Copies of the certificates can be requested. 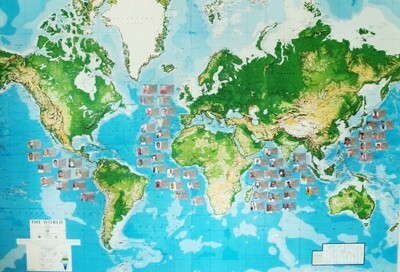 Sutter Medizintechnik sponsors a child for each employee now. Social responsibility is an established practice for Sutter. Since January a new era has begun: The company pledges to sponsor a child for each person who is employed at Sutter. Our people can choose a child sponsorship with one of the two organisations: SOS-Kinderdorf (http://www.sos-kinderdoerfer.de) or World Vision (http://www.worldvision.de). All over the world children receive the opportunity to lead a dignified life and get an education and future. vast experience with the audience. The symposium was sponsored by Sutter Medizintechnik, Germany. Two new studies confirm the efficacy of Sutter RF systems for turbinate reduction. In a prospective, randomized study on 84 patients who were treated with the BM-780 II at Central Hospital Vasteras, Sweden showed significantly better results than those who received corticoid nasal sprays. Sutter Medizintechnik has passed the DQS revision audit for the ISO standard 13485 and Annex II of the Medical Device Directive with outstanding results. Beautiful offices! After a year of modernization, the newly remodelled and enlarged office facilities in Tullastr. 87 and 87a have finally been completed. 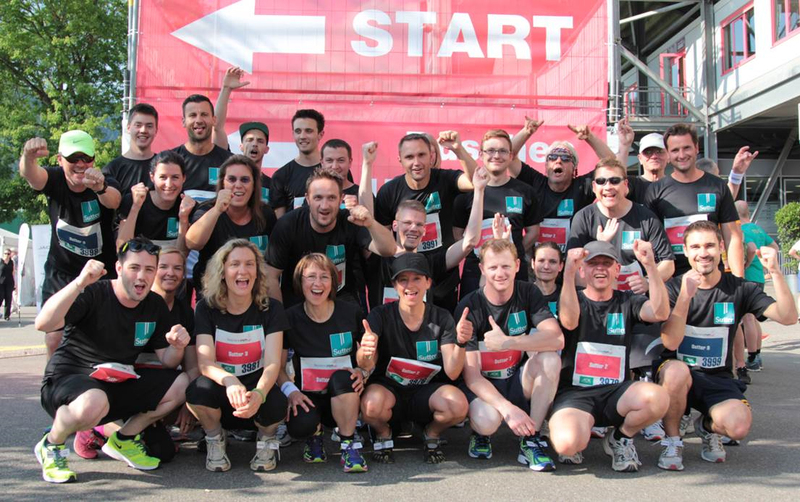 "We are glad to be able to work in a newly designed work environment and to have room for more growth”, says Bert Sutter, Managing Director of Sutter Medizintechnik. The modernization has not only led to a visual improvement. Both buildings have also become 20 % more energy-efficient than the strict German low-energy standard requires. A 24 kWp solar station generates green electricity. Environmental sustainability was an important factor in the choice of materials.